Japanese equities finally pass a bubble era milestone. Will the good news continue? After 26 years, Japanese investors had cause for celebration Friday with Tokyo stocks’ market capitalization finally breaking a bubble-era record. With corporate governance reforms set to commence in June, could more market records be smashed? On Friday, the market capitalization of shares listed on the first section of the Tokyo Stock Exchange (TSE) trumped their previous bubble-era peak by reaching 591.3 trillion Japanese yen ($4.8 trillion), exceeding the previous record of 590 trillion yen reached in December 1989. Although the Nikkei Stock Average’s close of 20,264 was nearly half its 1989 record of 38,915, a 62 percent increase in the number of publicly listed companies has helped the Tokyo bourse increase its capitalization. Market gains have also been spurred by the Bank of Japan’s massive 80 trillion yen monetary stimulus, which has included buying of exchange-traded funds and real estate trusts, while a weaker yen has boosted the profits of exporters such as Toyota Motor and Canon. Structural changes introduced after the global financial crisis have attracted more foreign investors, according to the Nikkei Asian Review. “It is easier to buy Japanese stocks now because the quality of the market has improved,” Richard Kaye of asset management firm Comgest told the Japanese business daily. Cross-shareholdings have shrunk from 30 percent of the entire market to around 10 percent, with foreign investors becoming increasingly active. From being minor players in 1989 with 4 percent of stocks and accounting for 10 percent of trading, foreign investors are now the main driver of activity on Asia’s third-largest bourse, owning 30 percent of Japanese shares and racking up 70 percent of trading activity. Direct foreign investment in Japan has also expanded, rising for a fourth straight year to reach 23 trillion yen in 2014, with the government targeting 35 trillion yen worth by 2020. 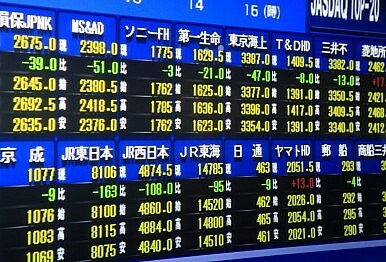 According to the Nikkei, foreign investors have turned bullish on Japanese stocks due to Abenomics – the economic program of the government of Shinzo Abe – as well as an increased focus by Japanese companies on return on equity (ROE), with a government commission recommending a minimum target of 8 percent. From a price-earnings (PE) ratio as high as 60 times during the bubble, the Japanese bourse currently trades on a PE around 16, “comparable to levels in Europe and the U.S. at 17,” the Nikkei said. The Japanese bourse is still relatively undervalued compared to the New York Stock Exchange’s $16.6 trillion capitalization, or the Shanghai bourse’s $5.5 trillion. “While the market cap may be at a record, today’s valuations of Japanese equities are a world away from what they were at the peak. This reflects the fact that Japanese companies overall have managed to grow earnings per share over time, despite effectively no nominal GDP growth over the past 20 years,” Ashburton Investments’ Tristan Hanson told Reuters. Tokyo stocks are also more attractive due to an average dividend yield of 1.6 percent, four times the current 10-year government bond yield or the 0.4 percent dividend yield of 1989. However, while the Tokyo bourse has welcomed new entrants in recent years, including Fast Retailing, Rakuten, and Softbank, the top constituents make familiar reading for veteran investors. Former national telecommunications monopoly NTT, which was the nation’s biggest company in 1989, is still ranked third, with its spin-off, NTT Docomo placed fifth. Japan Tobacco, another former government monopoly, came fourth, with the remainder of the top 10 comprising Toyota Motor and banks, similar to the late 1980s. “It is a mixed blessing. The top constituents of the market haven’t changed that much, showing lack of metabolism in the market,” Daiwa Securities analyst Eiji Kinouchi told Reuters. However, ahead of a new corporate governance code to be launched on June 1 that will require more independent directors, analysts at Daiwa Securities have revealed evidence of reform’s benefits for stock investors. According to the securities brokerage, companies on the TSE’s Topix index with three or more independent board directors delivered total returns exceeding those with no independents by about 25 percentage points in the two-and-a-half years through April, also outperforming the benchmark index. Firms with just one or two outsiders performed in line with the index, however. Topix companies with at least three independent directors delivered returns of 133 percent from November 2012 through to April 2015, while those with none posted 108 percent. The outperformance was even greater for the smaller companies listed on the Topix Small Index, where members with at least three independents achieved a 41 percentage point higher return than those with no independents. According to Bloomberg data, just 151 of the 1,875 Topix-listed companies had three or more independent directors as of their latest annual reports. Under Japan’s new governance code, companies will be required to appoint at least two independents or explain to shareholders the reasons for not doing so. Japan’s low ratio of independent directors compares to the U.S. Standard & Poor’s 500 Index, where all except two companies have at least four independents. Elsewhere, Australia’s ASX Corporate Governance Council recommends a majority of independents, including the chairman, while the Hong Kong Stock Exchange requires at least three independent non-executive directors. However, while Japan’s new code is expected to spur increased market value, Meno warned of a limited pool of independent directors for companies. Meno’s comments echo those of Nicholas Benes, head of the Tokyo-based Board Director Training Institute of Japan (BDTI), who has called for increased director training in corporate governance to ensure a “virtuous cycle” that accelerates reform. “Even two [independent directors] will allow you to have a committee of those two plus an outside statutory auditor, and that’s a major sea change by itself in Japan,” he told The Diplomat in a September 2014 interview. Benes also pointed to the potential for increased merger and acquisition (M&A) activity in Japan following its introduction of a stewardship code for investors and the new corporate governance code. “Japan’s proportion of M&A compared to GDP is about one-fourth or one-fifth the United States or Britain, it’s very low in an economy that needs to be restructured and refocused. One of the reasons it’s so low is that corporate governance in many companies is unable to make the decision to sell a division or subsidiary that’s non-core as soon as it should, so it goes bankrupt or they sell it – if at all – when it’s too late. Those kinds of situations should be prevented if you have more outsiders on the board,” he said. According to Seth Fischer of investment management firm Oasis Management, Japan is undergoing an “ROE revolution” that should further drive stockmarket gains. He pointed to the introduction of the Jpx-Nikkei 400 stock index, which ranks firms on ROE, operating profit, and market capitalization, the new governance codes and also pressure from institutional investors. The announcement in 2014 by Institutional Shareholder Services, an advisor to 90 percent of institutional investors such as banks and pension funds, that it would recommend voting against management at any Japanese firm with average ROE below 5 percent over the past five years is expected to help drive a focus on returns. “That [5 percent] might be a low hurdle in the U.S., where the average ROE on the S&P 500 is 20 percent, but more than half of companies on Japan’s Topix index have returned even less than a nickel per dollar of investment during the past five years,” he wrote in the Wall Street Journal. More than 160 Japanese and foreign institutional investors have already “pledged to dictate their proxy votes with the goal of enhancing medium- and long-term investment return by improving corporate value,” he added. “As Amada’s finance chief, Tsutomu Isobe, said last year of initially being excluded from the new JPX-Nikkei 400 index: ‘I wasn’t too surprised when I heard we hadn’t made it because I knew how low our ROE was, but our president was a little shocked.’ He added: ‘We’ve had lots of requests from foreign investors for one-to-one meetings in Japan since our announcement [to boost ROE to 7 percent to enter the index]. It’s pretty much doubled from last year’,” Fischer wrote. On Friday, the Bank of Japan said the economy “has continued to recover moderately,” with the latest GDP data showing that the world’s third-biggest economy expanded by an annualized 2.4 percent in the January-March quarter, exceeding expectations of a 1.6 percent rise. According to the IMF though, soft inflation data mean “the BoJ needs to stand ready for further easing“ to achieve its 2 percent inflation target. With the prospect of further monetary stimulus, corporate governance reforms and a new drive for increased ROE, Japan stock investors could have more reasons to celebrate soon as the Nikkei finally shakes off its post-bubble blues. Can a huge IPO convert nation of low-risk bank savers into higher-risk stockholders?